Once December starts, the countdown is on as students eagerly await a l-o-n-g break at the end of the month. With fun holiday activities taking place at school throughout the month, our weekly schedule goes haywire, and it seems like classroom time is limited. I've got to make whatever we do in class count! Even if we can't start a lot of new material, I make sure to pack in as much skill practice as possible while incorporating the ideas of the season as well. 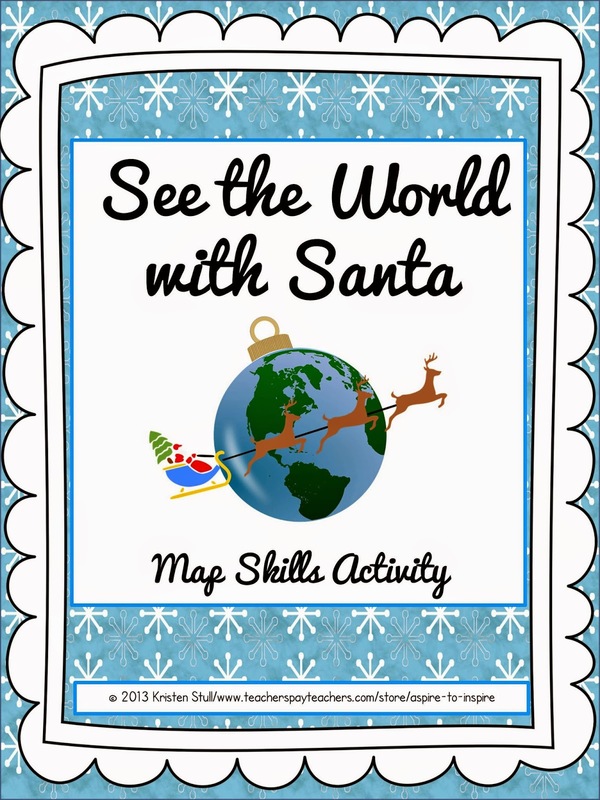 One of the activities I created is a map skills activity called See the World with Santa. Students go on an international adventure with Santa Claus as he makes his way around the world. This activity requires student use of a map, atlas, or globe to identify world cities by latitude and longitude as well as the countries, hemispheres, and continents in which they belong. Students are also asked to research some additional information about climate, currency, and language all related to Saint Nick himself. It works well for individual and small group use. It's also an activity that can be worked on in chunks, which is perfect for those little bits of down time between all of the holiday activities. Wishing you season's greetings and a happy, healthy 2015!